It’s become a tradition with some special internet friends of mine, to light a candle on Christmas Day as a symbol of the great friendships we have. 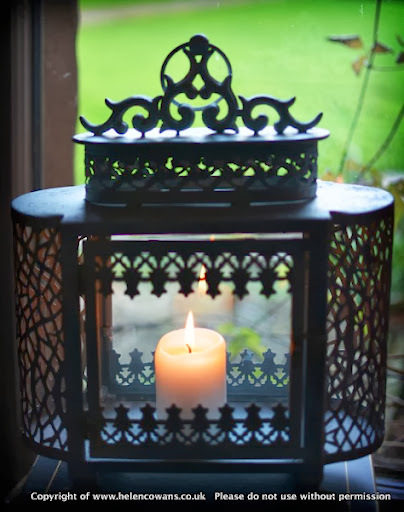 This years candle is burning brightly, thank you all (internet and local friends) for…well, just being there. This year the candle is also in remembrance of Carol, Val and Hazel, its been a sad year. 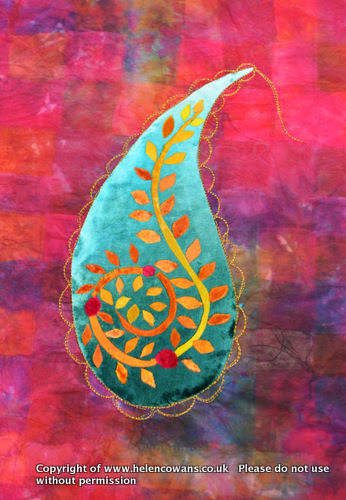 ….Will be on fabric decoration, shisha mirrors and calm meditative stitching. It could be that I work on two workshops at once as I tend to work on this one in the evening and this take a LOT of hand stitching and a LOT of TIME. Slow down…. take it easy…… chill out. I’m happy to say that the launch of the first online workshop went very well, (considering we are almost at the silly season of Christmas). 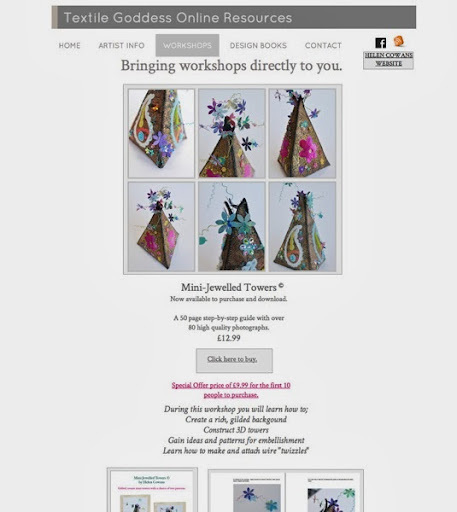 You can visit and buy at the online workshop website here. Finally. 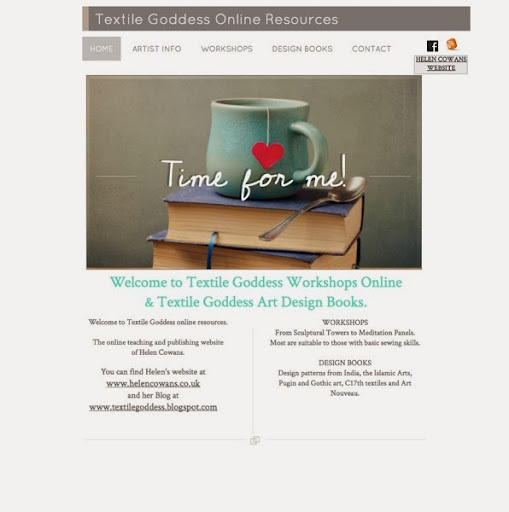 After so many of you have asked me for online workshops….. here we are!!!! I am MORE than happy to announce….. 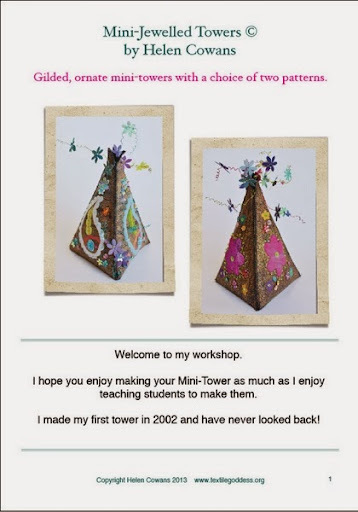 The first workshop on Mini-Jewelled Towers is now up and the first 10 people will be able to buy it for a special price of £9.99. 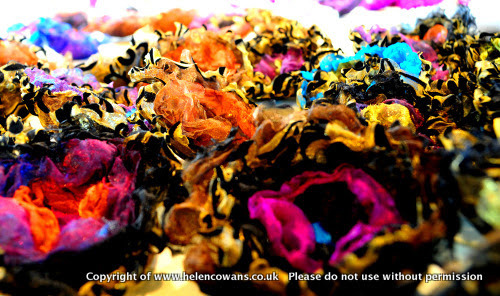 Please help me spread the word to the rest of the textile world! Am SO excited as tomorrow I’m launching a BRAND NEW VENTURE! Something really new for me. 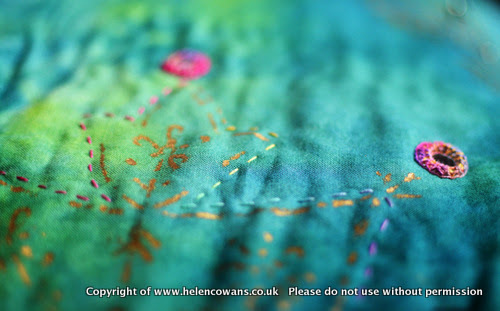 A way for me, Helen Cowans, aka the Tower Lady, aka Textile Goddess Blogger to reach across the global community from the back end of rural north Northumberland. I hope I’ve got it right! (And it explains what I’ve been doing for the last two months). Wow, two blog posts in a row – am I getting back into the swing of blogging? Hope so. So this was progress yesterday about 2pm before the light faded too far for photographs. Morning! 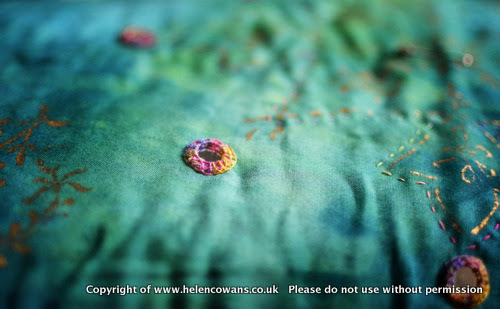 I’m starting work on a project for an exhibition at Wallington House in August. So first off is creating the background. The space I have in the cafe gallery can accommodate one large piece or four smaller ones. Initially I thought of making a large wall hanging. But then my sensible brain kicked in and reminded me that four smaller pictures were more likely to sell to the general public. As I want all the pieces to work as a theme the background is the same for them all. Then it all needs sewing into place. …or without black chiffon layered on top too? 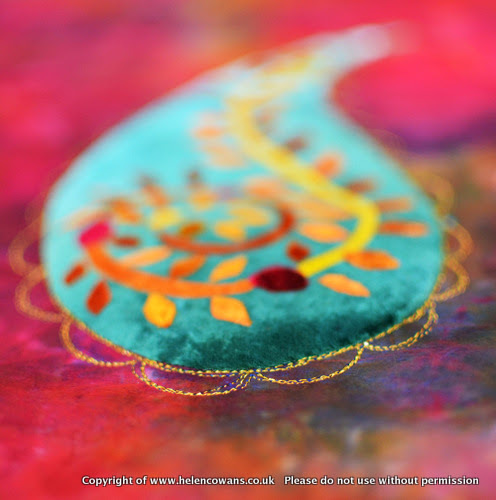 I decided without – I loved the bright colours too much. Over the weekend, between feeding two teenage boys, watching a football match and coping with a tired, jet lagged DH I managed to create four designs with inspiration taken from a dresser in the Hall. Its all sketched out and transferred to bondaweb ready for appliqué today. Feeling very positive about it. For those who like online classes…. check this out . Some great classes at reasonable prices. 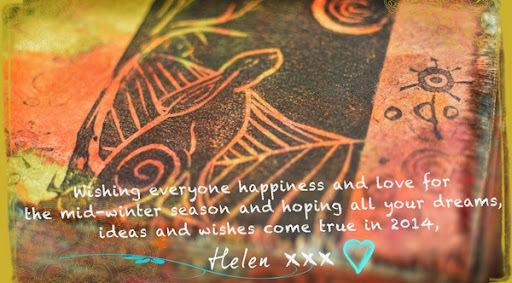 Have signed myself up for surface pattern design and digitizing calligraphy classes for only £19 for the two.